At this years PhotoPlus Expo at the Javits Center in New York City, ThinkTank pre-announced the release of their Modular Rotation System (MSRP $142.75) and Modular Rotation System Skin™ Components (MSRP $132.75). Both systems have been completely redesigned, with many new cases and pouches added. They are live on their website, www.thinktankphoto.com, and will be available for sale in early December. If you're interested in the Modular Rotation Component System v2 or System Skin v2, fill out the FORM that ThinkTank has provided and they will email you when Version 2 has arrived. Modular Rotation System is now available. 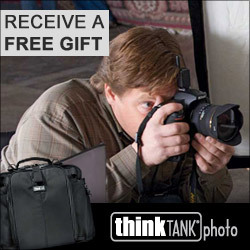 You can purchase them from ThinkTank Photo. Santa Rosa, Calif. -- In response to customer feedback, Think Tank Photo’s has completely redesigned its Modular Rotation System to provide additional features and benefits, including easier photography gear retrieval, better equipment fit, and an updated/inclusive style. The Modular Rotation System consists of three product groupings: Lens Cases, Gear Pouches, and the Modular Component Set V2.0. The new items will be available for sale in December at www.thinktankphoto.com. The Modular Rotation System is part of Think Tank Photo’s integrated modular belt carrying solution, which also includes its Skin™ components. The Lens Cases and Gear Pouches feature padded components and the Skin components features unpadded pouches. The new Modular Component Set V2.0 includes the Lens Changer 50 V2.0, LC 75 Pop Down V2.0, Strobe Stuff, Speed Changer V2.0. All can be transported in the breathable Large Travel Pouch. All of the elements can be carried as a set or as individual items on Think Tank Photo’s Pro Speed Belt V2.0, Steroid Speed Belt V2.0, or Skin Belt V2.0. 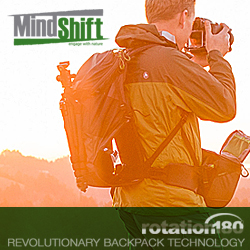 The new Keep It Up™ Shoulder Strap provides vertical support to any Think Tank Photo belt and includes a memory card holder. Wide mouth opening allows for smoother lens retrieval and replacement. One-hand drawstring closure with the auto-locking mechanism: only one hand is needed to securely close the pouch. Zippered bottom pocket includes seam-sealed rain cover. Top handle allows for easy gathering of multiple pouches. Smooth back reduces wear on clothing and helps components slide easily around the belt. Padding under lens cover protects lenses from bumps and bruises. Improved front pocket material for increased durability and elasticity. The Lens Cases consist of the Lens Changer™ 15 V2.0 (accommodates tele-converters and small primes with hood in shooting position), Lens Changer™ 25 V2.0 (small telephotos with hood in shooting position), Lens Changer™ 35 V2.0 (24-70 2.8 with hood in shooting position), Lens Changer™ 50 V2.0 (wide angle lens—16-35, 17-40—with hood in shooting position), LC 75 Pop Down™ V2.0 (70-200 with hood reversed or in position), and the Lens Drop™ (standard telephoto zoom lens). Secure front pocket with increased hook and loop. Improved rip-stop nylon for increased durability and discrete styling. The Gear Pouches consist of the Strobe Stuff™ (pro-size flash with some lens modifiers attached), Slim Changer™ (standard-size body, lens not attached), Speed Changer™ V2.0 (pro-sized body, lens not attached, and small telephotos and pro-size batteries), Stuff It !™ (accessory pouch for all your stuff: CF cards, batteries, filters or pocket wizards), Little Stuff It !™ (accommodates most point and shoot cameras, including Canon G12 & Nikon P7000), Hubba Hubba Hiney™ (70-200 2.8 lying down or two to three smaller telephotos; includes shoulder strap), and the R U Hot ?™ (for water bottle, hat, gloves). Both the Lens Cases and Gear Pouches come with Think Tank Photo’s unique Rotate and Lock design feature so that components slide along the belt or fasten in a specific position on the belt. Santa Rosa, Calif. – For those photographers who want no padding separating them from the gear on their belt system, Think Tank Photo has completely redesigned its Modular Rotation System Skin™ Components to provide additional features and benefits. These include easier photography gear retrieval, better equipment fit, and an updated/inclusive style. The new items will be available for sale in December at www.thinktankphoto.com. The Skin components are part of Think Tank Photo’s integrated Modular Rotation System belt carrying solution. The Skin Components feature unpadded pouches and the Lens Changers and Gear Pouches feature padded components. The new Modular Skin Set V2.0 includes the Skin 50 V2.0, Skin 75 Pop Down V2.0, Skin Strobe V2.0, and the Skin Body Bag. All can be transported in the breathable Large Travel Pouch. All of the elements can be carried as a set or as individual items on Think Tank Photo’s Skin Belt V2.0, Pro Speedbelt V2.0, and Steroid Speed Belt V2.0. The new Keep It Up™ Shoulder Strap provides vertical support to any Think Tank Photo belt and includes a memory card holder. All Skin components come with Think Tank Photo’s unique Rotate and Lock design feature that allows components to slide along the belt or fasten in a specific position on the belt. They also feature the Skin system’s “sound silencer” functionality that silences hook and loop noise. We're Back from PDN PhotoPlus Expo 2011!